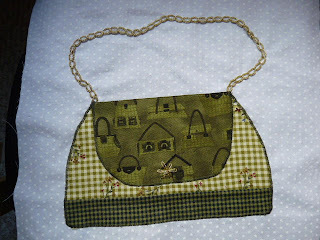 I've been sewing lately, just not quite as much as usual. I have a 3rd kid now out of school, which makes things more hectic. He doesn't sleep in as late as the others, and naps are off his agenda! Plus the dynamic between he and his 5 year old brother leaves a bitter taste in my mouth, making me too mentally frustrated some of the time to be an efficient and accurate quilter. None the less, there has been a little progress. 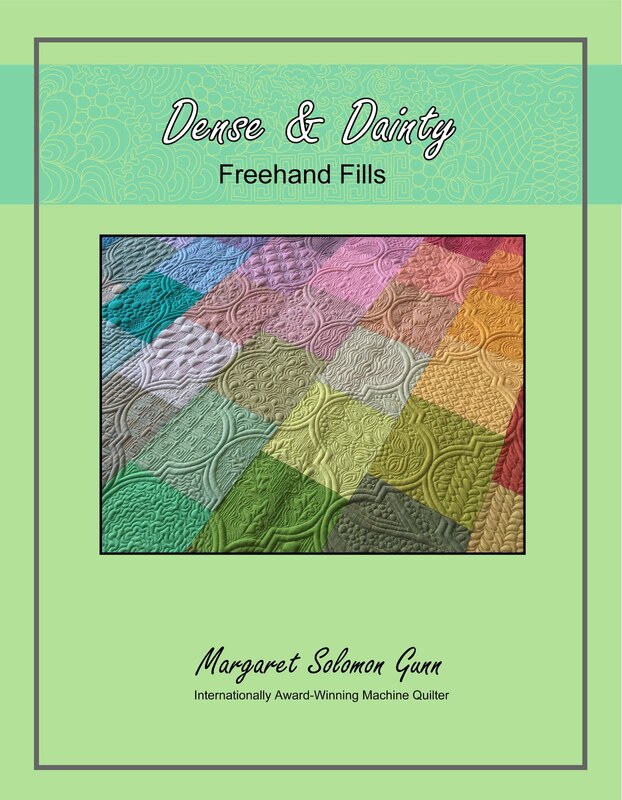 I have learned of a local machine quilter who's price is very reasonable (~$100 for a queen). I'm going this afternoon to see some of her work. I saw a small piece she did that my mom received as a retirement gift and it's nice. If all checks out OK, then she will be quilting my older son's quilt. 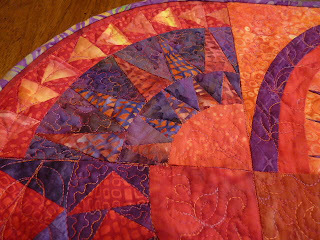 I spent time the last 3 days getting the backing (below) pieced. It's all from leftover Bento blocks and pieces of the Kona/Bella solids. It's busy, but I like it. Yesterday, I had just had enough of working with the very large backing (above) pieces, and needed to make progress on a flimsy that I could quilt this week. Sooo...I pulled out 12 6-1/2" squares from my dwindling pile of Kaffe Fassets, and bordered them up. 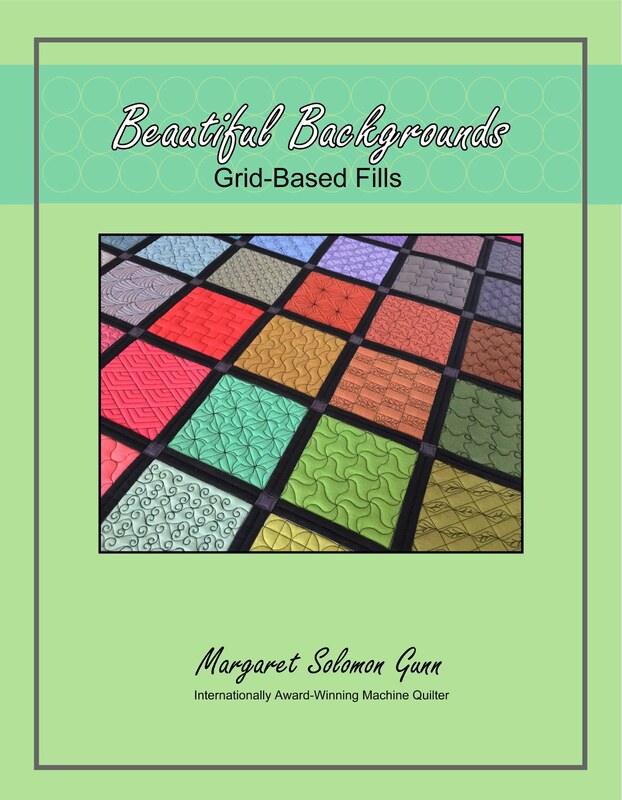 The borders are bold, in-your-face type prints, but colorwise, they coordinate well with the center squares. 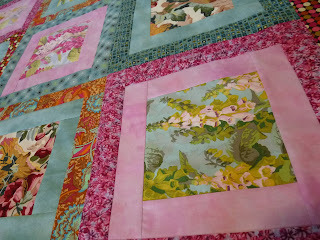 I hope to get this quilted and finished this week. That should leave things wrapped up nicely for starting the sewing on my daughter's birthday dress next week. 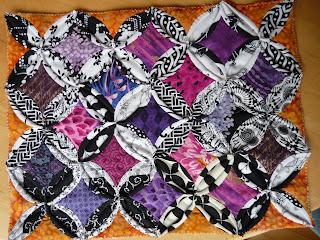 And last but not least, here is Kate's birthday block, and the end to the swap she so patiently hosted. She asked for texture, and short of glueing burlap to a square, this is what I came up with. 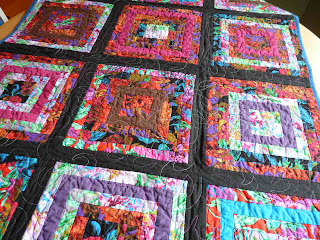 It gives me a new appreciation for this type quilt. This is 10"x13", and took about 6-8 hours of hand work. I'll need a lobotomy before I make a full bed quilt in this pattern!! I know by posting this here, I am decreasing my chances of that fantastic box of scraps giveaway, but then! 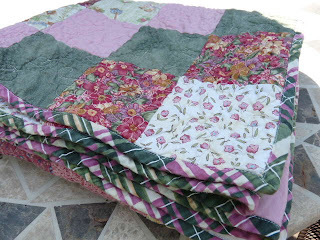 Go have a look...they'd be so perfect for my Linus quilts should I win! I know this blog is mostly for sewing adventures, but it's hard to pass on a couple very cute pictures of my soon-to-be-not a two year old. 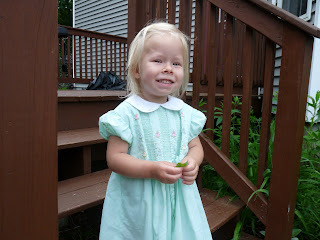 I mostly put these in because she's wearing the prettiest smocked dress. In fact, this is the very dress I wore on my 1st day of kindergarten...38 years ago! Yes, I must have been something tiny. It fits her pretty well. The bullion embroidery around the dress is quite lovely & dainty, and well beyond my patience level. I finished these 2 Linus quilts a couple weeks ago during a sewing lull. We finally had a break in the month-long rains, so I could get them outside with the camera. This one is all from my scrap strips box. Sadly, I don't think I even made a dent in the box. 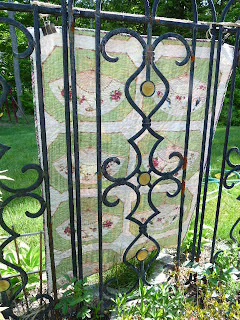 It does lay flat - the folds at the sashing are because it was folded up for a few weeks. This one is kind of like "gramma's attic" to me. I pulled darks and lights from my box of precut 4.5" scrap squares (it is down to about 1200 squares now!). It's not my favorite, but If you squint your eyes just right, you can detect the pattern! It is a case of complete salvage. Two yrs ago I bought 4 unused lavendar curtain panels at Goodwill for a buck or two each. They had 2 yards of fabric in each! I pulled them out for the backing and binding! There is no fabric that I won't eventually use! I have been playing in EQ6 for a month now, designing different things to make with my 25 FQs of hand-dyes I got last month for my birthday. 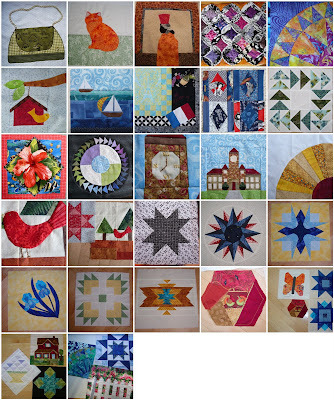 I have contemplated a variation on a Lone Star as well as a detailed New York Beauty quilt. Both of those got overruled. I'm just not in the mood for the paper piecing right now. I love this idea. The tree in the center is just pictorially - It will really be more "tree-like", with actual leaves in all of the colors. I'm calling this my Tree of Life. 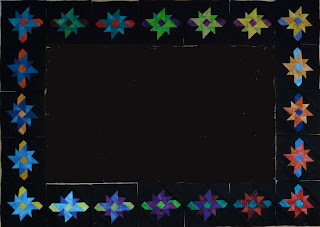 The first border of intertwined pinwheels/stars is immensely tedious. They are small, only 4" square when finished, plus they are a partial seam construction. Some of you may recognize this as the construction from the Colorblocks (the 4SQS5 summer block swap). In theory it is not hard, but the tiny size of these makes it difficult. Here's a look at the first 4. I have nearly 9 done now, and hope to have all 20 by week's end. 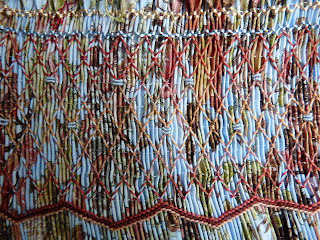 I have also nearly completed the smocking on the dress I am making my daughter. It's fairly simple, but I thought that was OK since the fabric is pattern-heavy. I'll begin dress construction soon. You can double click for a better look. These are most of the blocks I made for the Birthday Block Swap. I was in 2 groups, making 1 block for one group and 2 for the other group per month. I missed taking a picture of a few blocks unfortunately. It was a fun swap, despite the headaches for the awesome host, Kate. She did a great job of managing so many people. Some of these blocks challenged my patience. Some I just dreaded making. 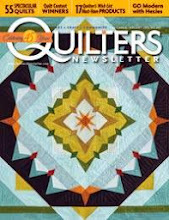 But most streached my abilities as a quilter, and my limits of creativity. 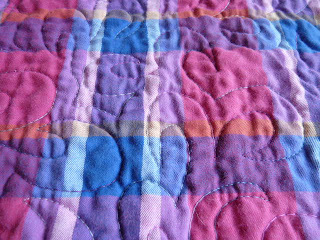 The blocks (Broken Heart pattern from www.quilterscache.com) that I received from Group 3 were used to make 2 quilts similar to this one. 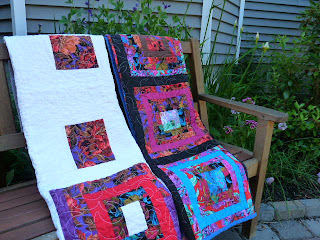 Both of these quilts were donated to the children's quilt charity, Project Linus. My Group 4 blocks, New York Beauty, were used to make these for my dining room. I'd love to see links to things that others have made with their blocks! 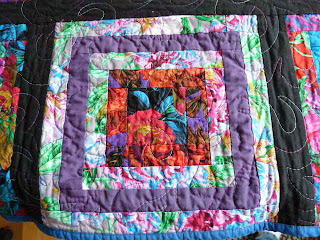 Some weeks ago I made this flimsy from some 10" Kaffe Fasset squares I bought last year. It's bold and bright, but left me with a few squares and strips of the material, and nothing but an idea of what to do with the remains. 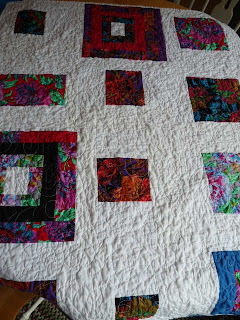 I have seen quilts done with randomly placed squares on a white background, and am often intrigued to make one. I usually pass because these require so little design work that I lose interest in the process. This time I gave it a try (the white one). I gotta say, it is not my favorite quilt. This is in part due to my misdoings - I had to buy more white Kona and apparently what I bought was ever-so-slightly different in color than what I started with. It's a subtle difference, but it shows a little bit. I'm not really sure if that is why I don't "love" this quilt. It's OK, just not my favorite. 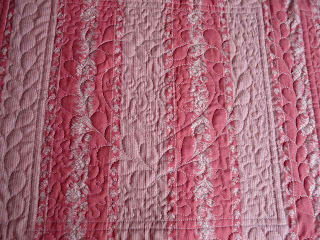 It puckered up a lot in the wash, so much so that the quilting pattern is hardly recognizeable. It was done with swirly curves. Here's the black one. I like this a lot. 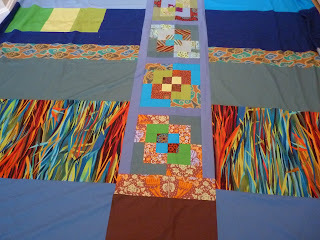 Rather than quilting it in a black thread, so as to blend in on the sashing, I used a turquoise and purple variagated. 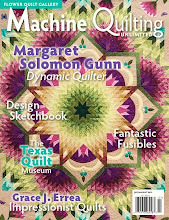 It makes the quilting pop, which I like. Perhaps I like this better because it is orderly. It is colorful, not just a vast expanse of white awaiting a few pops of color. The back is a plaid that came from my mother's stash. It dates to sometime in the 1980's. I remember her having a skirt made from this material! Anyhow, it's unbelievably soft, almost like a flannel. So maybe, they were not twins at all. Perhaps one is just the Ugly step-sister?! 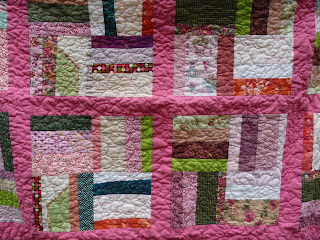 My Diamonds are a Girl's Best Friend quilt came back from the quilter a few weeks ago. I mailed this one off to someone I'd never worked with before, but she came on good recommendation. This is about 52" x 80", and will be used by my daughter, first as her bed quilt, and then as a secondary blanket when I think she is old enough to use this quilt without damaging it. I love all of the modern pink and green prints I used. It's very lively and fresh. 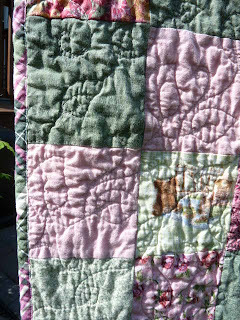 The quilting...It's a good story and a horrid story. The Good: inexpensive. I mean very inexpensive ($15). I paid more to ship it than it cost to have it quilted. 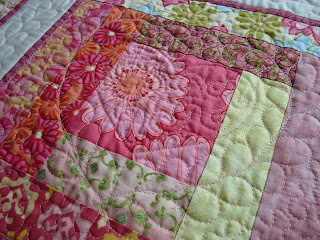 Generally, the quilting looks good. No huge puckers. Pretty pattern. 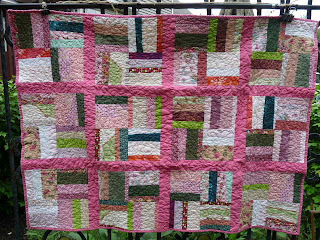 The Bad: It's quilted in rows, which isn't necessarily a bad, except that this originally had a 3" wide yellow border. 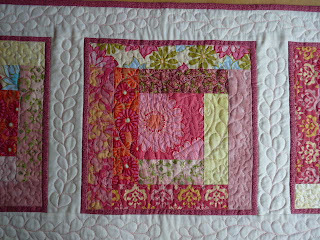 She quilted right through the border on the sides and partially through it on the top and bottom. That looked absolutely wretched. 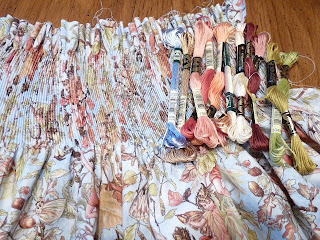 I pulled it out, all 12+ rows of it that went thru the border, and painstakingly knotted and burried short 3" pieces of threads. In her defense, I was forewarned by the person that uses her regularly that the edges are sometimes not so good and have to be cut off. I just didn't know how to heed this warning reasonably. 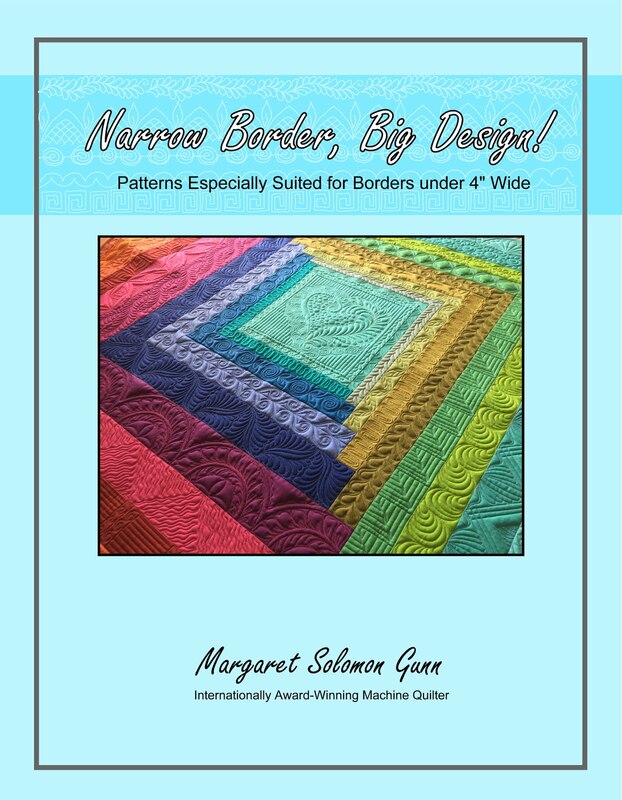 I'll probably use this quilter again, I just won't put a border on the quilt! Sadly, this quilt has my absolute most embarrassing and hideous binding work. I only have myself to blame there (though the quilting adventures did play into how I chose to bind it). 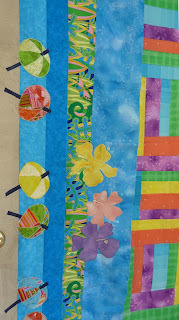 I used the yellow that was the border as the binding. It's closer to a 1/2 " binding, which I don't love. 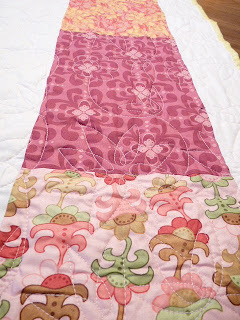 Plus the edge of the quilt does "wiggle" a bit in a few places and that is hard to disguize with binding there. If it weren't staying right here in my house, I'd have ripped it off altogether, and redone the binding. The corners are ugly. It's, like I said, not good, but not so bad that I'll lose too much sleep over it. 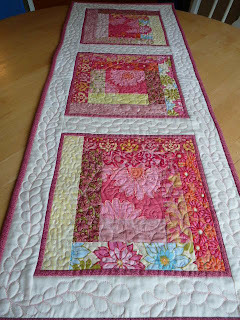 Here's a couple looks at the flowery pantograph done in a soft pink thread. The backing is largely white with a wide pink pieced stripe. 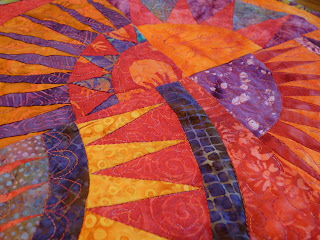 This quilt is of a size that I could have done the quilting, but I wanted to test out a new machine quilter on a piece that wouldn't be critical if it was not perfect. 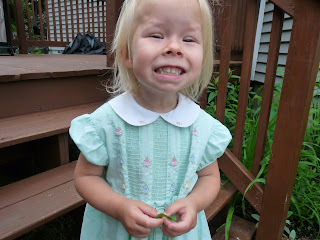 My daughter's birthday is 2 months away, and I have decided to make a smocked dress for her. I found this fantastic Michael Miller Autumn Fairies material on sale. The color is more sky blue - thanks to a 15th day of rain and clouds here, all my colors are wshed out and dull. That's the assortment of floss colors that I will choose from. I have already shirred the fabric. Hopefully I'll be finished up with other dulling priorities this afternoon so I can start on this tonight. ...and a close up of the fairies here. There's a tiny bit of gold leafing throughout the fabric. It's really sweet and lovely. My cousin's only daughter is getting married this weekend. I had originally made this, and then labored over what to do with the awful dark brown threads. I sewed the label over them and thought I was done. A month passed and I realized how much I truly hated it. I had RSVP'd for the wedding, then couldn't find a babysitter for 6 hours, backed out, only to have her contact me saying she'd intended for the entire family to come anyhow. So my decision to make something else felt even more prudent. Last week, I made this. 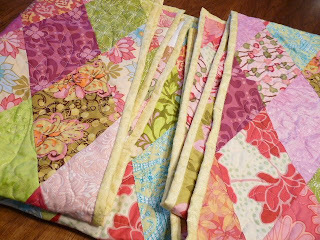 My cousin loves pink, and I have a gorgeous collection of very modern pink prints right now, thanks to making a pink quilt for my daughter. The only criteria I had for this replacement gift was that it needed to be relatively simple. It did have to be finished in a week or less. Afterall, I had a ton of things needing finishing last week. It is 15" x 38" (hope she has a rectangular table!!). I love how it turned out. 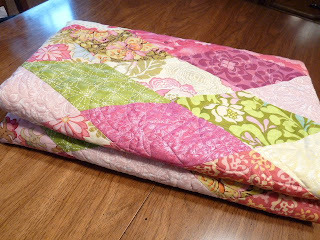 It's a simple log cabin pattern, with the pink dahlia flower in the center of all of them. There is a stipe of butter yellow Fairy Frost on each block too. It's bordered in Kona white, and bound in pink. I honestly hated to use all of the Anna Griffin pink I had on the back, but it did match superbly. 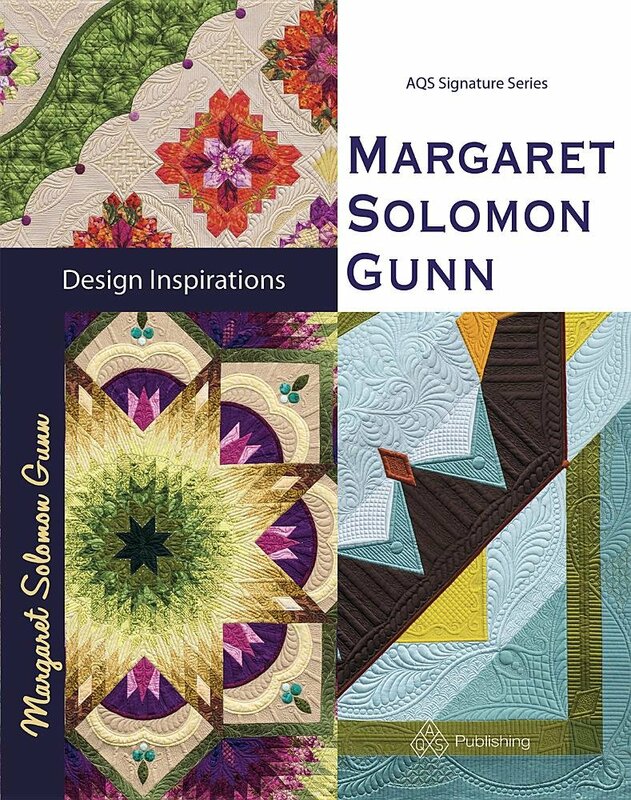 The quilting is very similar to what I did on my son's teacher's apple quilt. It turned out very well. Incidently, we gave this to her today, and she loved it. Heck, who wouldn't?! The center of each log cabin has a feathered heart. ...and my sewing room is down these stairs!! The row robin swap, despite not having a host anymore, is on the 3rd row too. 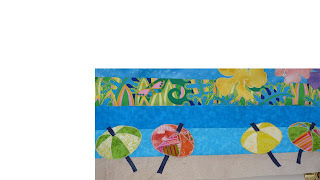 This is for Robin, who asked for a "beachy" feel. My row is the umbrellas. 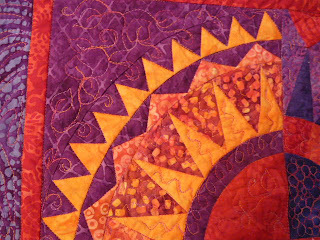 I'm not a fan of machine applique, but I did it so as to match the previous row. Parts of the umbrellas have Fairy Frosts, so they shimmer like real umbrellas might. ...and a closer look (maybe if you dbl click!) - I had a very productive weekend. I took my kids off to an animal park Saturday morning to give my husband a break. He watched them on Sunday morning until lunch so I could sew. Sounds fair! I managed to get these block/row finished, a binding on a Linus quilt, and work most of the machine quilting on my SFRR3 quilt, which arrived last week. It has some hand beading & label to still add, but the binding is even on! It's really awesome and I can hardly wait to show it. The gals that worked on it before it came to me did a FANTASTIC job! 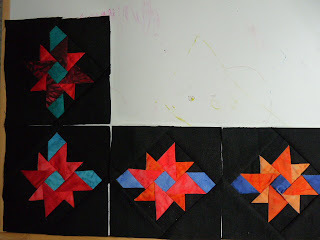 On Sunday, I even got started quilting my ALQS3 Orca mini. 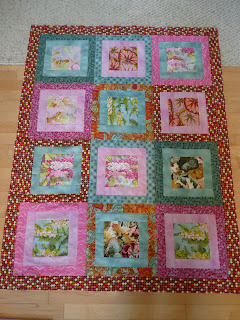 This one is looking really good as well, but has a bit of quilting left still before it's July due date. 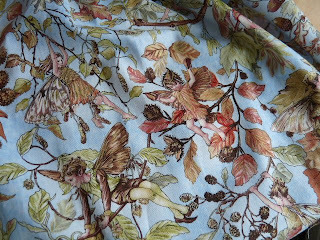 - Yesterday I shirred a piece of blue check that I've been waiting to make a smocked dress from, only to find I really dislike it. I've had it a couple years, and everytime I get ready to use it, something changes my mind. I have decided that this 5 1/2 yards of 60" check must go elsewhere. I perused the web for something I like better and found this. It will look fantastic, and is nice and playful for my daughter when she turns three in August. Seems like innocent enough fun, right? Last Friday morning while my 2 year old was having physical therapy, my almost 5 year old and I were busy coloring squares on graph paper. I had a plan to make a Linus quilt from assorted 4-1/2" squares cut last month. This box, incidently, has about 1500 various squares now! This is what I colored (marked into 9 sections just for easier construction than long rows), and the greens and pinks pulled from the box. My son did not really understand the process until I showed him the finished quilt top a couple days later. 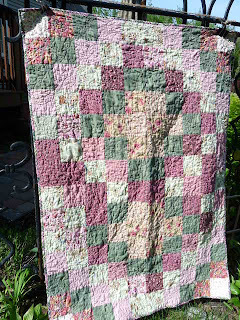 The finished quilt puckered up quite a lot when it was washed. It's almost hard to even see the quilting in the pictures. I did a vining-leaf pattern diagonally down each row. 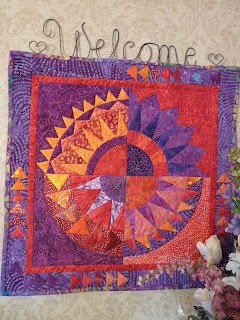 The quilt is 40"x54" - a good size for a tween or older child (age 7-11). The backing is an Asian fan fabric that was bequeathed to me after a Linus function last year. It's not my taste, but who gives up 2-3 yards of good quality material? I knew it'd get used eventually. It coordinates well, and is even placed squarely (as I roll my eyes in utter surprise!). VERY puckery and soft. 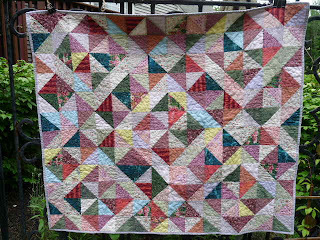 This is quilt #32 for 2009 to be donated to Project Linus. Not too shabby, if I do say so myself. So what else is brewing??? I'm finishing up a wedding present which I'll show next week. It was unscheduled, and had to be done this week since the wedding is next week, so as a result, this threw my entire sewing plans askew. I got back my Diamonds quilt from a very modestly priced machine quilter, and I am fixing things on it (yes, the adage "You get what you pay for" does hold true). 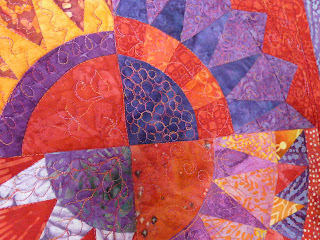 But, thanks Lisa anyways, she did a fine job for this particular quilt!! I'm making my last 2 birthday block swap blocks. One is for the hostess Kate, so I'm frantically trying to plan something appropriately designed. 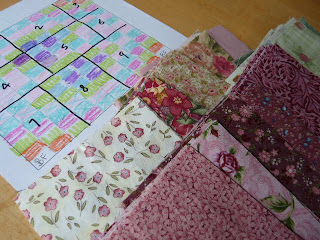 Gearing up to quilt my Spring Fling Round Robin piece, as it is currently enroute to me. 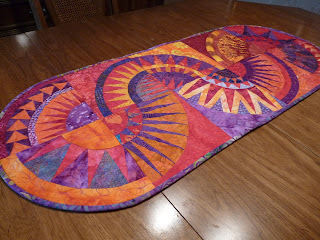 I finished the flimsy for my ALQS3 art quilt. It'll get quilted in a week or so. I like it, and you will too if you like Orca. For the last 11 months, I have made blocks for the birthday block swap, hosted on About.com's forum, and hosted by Kate. I've been in 2 groups, making three blocks most months. 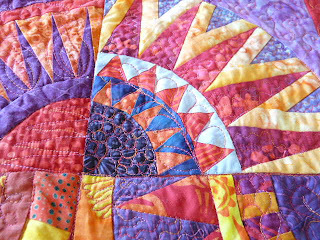 Some of these months have been great fun, and others it has been a total chore designing & sewing the blocks. Because one of the groups is more advanced, we had more challenging blocks assigned. Three people in the swap requested New York Beauty blocks, including me. Now, I do sew curved seams, but I'd never done much paper piecing, and I'd never done an NYB before. I was undaunted! So last weekend, my mother asked if I'd done anything with the blocks yet. Of course not - they were sitting patiently in a bag awaiting the other two, because, afterall, what could I possibly make with 14 of them?? Then the magical solution hit me. A matching pair for the dining room! My walls are at critical capacity and I am very POKEY at changing my mini's seasonally. But there's a hanger in the dining room, and I do swap them out in there with regularity. Voila! So here's a fuzzy (damn my camera and it's operator) look at the two pieces together - 4 blocks for the mini, and the other 10 for the table topper. I'm totally in love. The colors are hot, and vibrant. I fixed the ailing blocks I had received, and ignored the tips I had to nip off. I love how I chose to remove the last arc on the ends so as to make it oval. It's so perfect (grins). 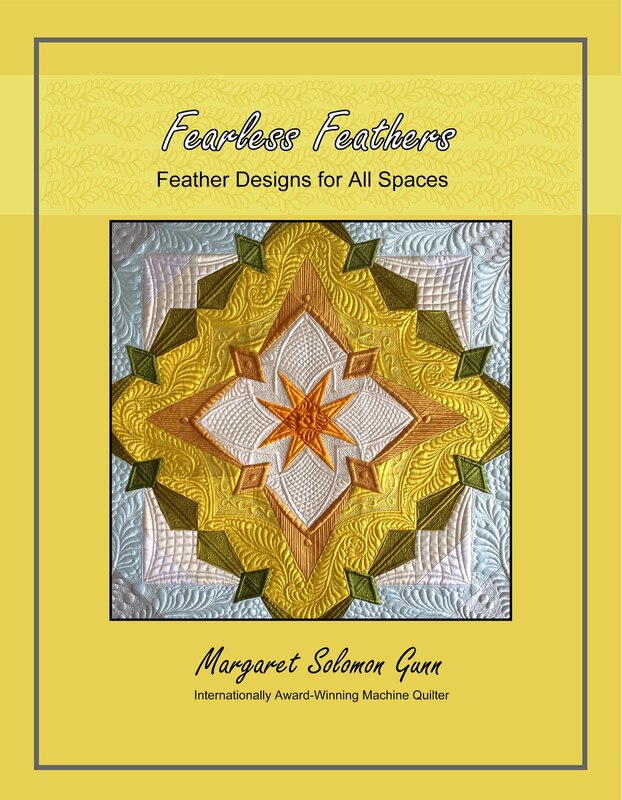 Be gentle on my quilting. I more or less just sat down with a blank canvas and a sewing machine and let the NYB speak to me. 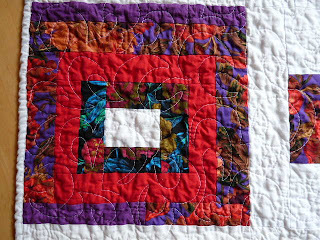 Each block is quilted differently. There's a lot of ditch stitching, which I am still working on being more patient with as I sew. I placed the blocks with curved geese at the ends of the runner. Love it! 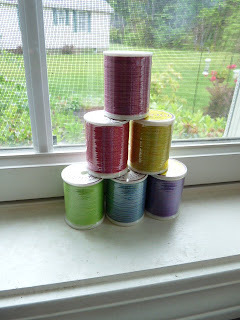 I used a King Tut variagated red, yellow and purple thread ordered last fall. It worked out just great. In fact, I ran out before the mini was done so I had to get more. 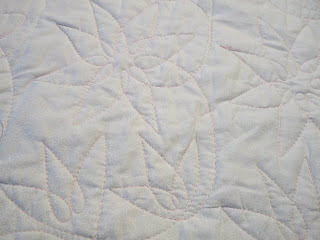 Here you can see the bits of leafy vining quilting and some feathering. This is a block Julie sent which she wasn't sure would play well with others. It's color is a bit marroon and yellow, rather than red and orange, but it blends pretty well. I like the many pointy spikes. Here is the 20"x20" mini. Many of the swappers sent swatches of their fabrics. 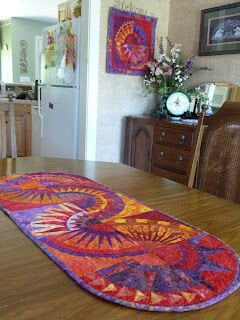 I had intended on making a large wall hanging, and doing a flying geese border around it. In the end, my hanging is much smaller and fewer geese were needed. 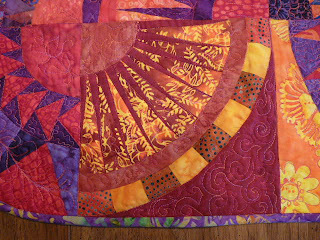 And much to my TOTAL disgust, as I was finishing the quilting, I discovered that the right hand border was sewn on upside down, and the darn geese were flying north, not south! Tell me I was not something ticked!! The two bottom blocks were made by me. 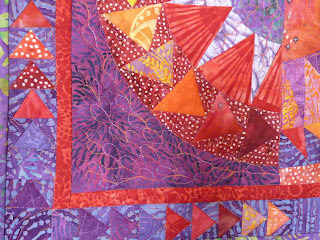 The quilting of this piece is similar to that on the runner - flames, vines, circles, feathers, etc. This is one of those projects that is best seen in person. In retrospect, I ought to show a picture from the back, but I'm tired of trying to get a shot with decent lighting for today! To all of you that contributed blocks to this project, my sincere thanks. I love how it all turned out!